Air Force officials will host an open house meeting tonight to talk about proposals to provide drinking water to Moose Creek residents whose well water has been made unpotable due to groundwater contamination. Officials with the Air Force Civil Engineer Center will unveil a plan to build a water pipeline from the North Pole water-treatment plant to Moose Creek during Monday’s meeting, which begins at 6 p.m. at the Moose Creek Fire Station. But Eielson Air Force Base spokesman Lieutenant Kitsana Dounglomchan says the officials also will talk about alternative proposals at the meeting. Dounglomchan says engineering center personnel believe building a 5-mile pipeline from North Pole to Moose Creek is the best of seven alternatives they’ve developed to provide potable water to the community. 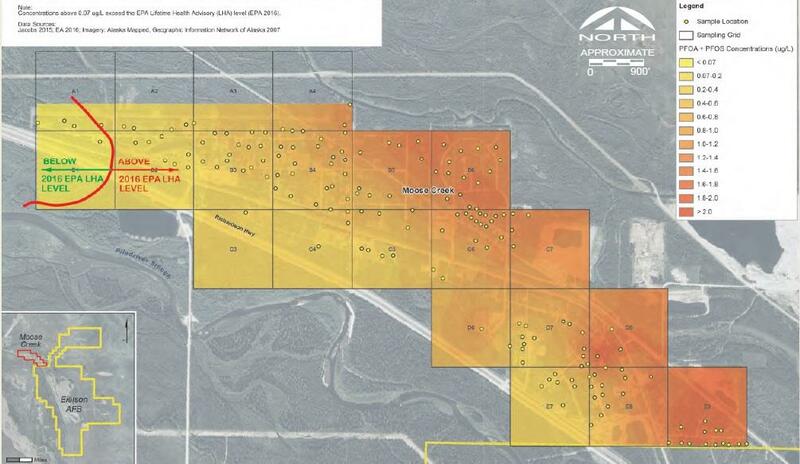 The area’s groundwater has been contaminated with two types of perflourinated compounds that came mainly from a type of firefighting foam used at Eielson in years past. But he says if residents think one of the other alternatives would work better, they can comment on that at the meeting. Those other alternatives include piping water from Eielson’s water-treatment plant, and installing tanks and delivering water to each home or business in the community. The preferred plan to build the pipeline from North Pole is estimated to cost just over $25 million. Dounglomchan says if that’s the alternative the public and the agency agree on and the decision is made final this summer and funding appropriated this year, water could be flowing within five years. “We would expect the project to be completed by around 2022 or early 2023,” Dounglomchan said. Dounglomchan says more information about the Interim Proposed Plan for Long-Term Water Supply for the Moose Creek is available from the Eielson public affairs office.